PHOTO: Allen Ramsey, DWCPhoto.com. Highlands second baseman Grayson Heck (10) grabs a toss from shortstop Jake Whitford (4) to just nip West Jessamine runner Tucker Greer. PHOTO: Allen Ramsey, DWCPhoto.com. 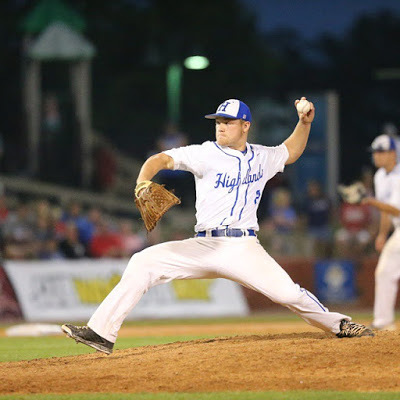 The Bluebirds came back to Fort Thomas with a state runner-up finish in their first appearance in the state championship game in school history. PHOTO: Allen Ramsey, DWCPhoto.com. Highlands senior Jacob Noe fires away in the seventh inning. Noe is one of 12 seniors to graduate as the Bluebirds made a historic run in the postseason. They hoped for one more giant step in program history. But in order to do that, the Highlands Bluebirds baseball team needed to use the same strength of solid pitching to neutralize what got the West Jessamine Colts to the Rawlings/Kentucky High School Athletic Association State Championship game. That is solid hitting. Like the other three state tournament opponents, the Bluebirds could not contain the potent Colt line-up. West Jessamine scored six times in the top of the first inning made the lead stand up in a 10-3 win in the championship game. Neither team had ever won a baseball state championship as Highlands advanced to the title game for the first time in school history. 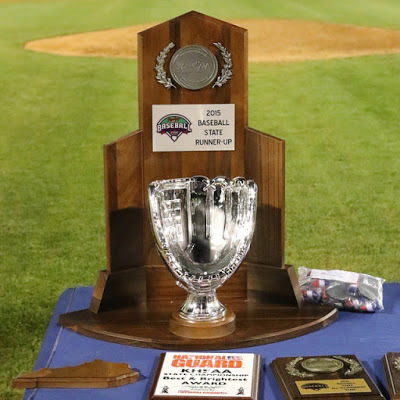 The 12th Region champion Colts (36-7) scored in double-digits in each game of the tournament. They outscored those opponents, 48-19. "They were obviously on fire offensively all week," said Jeremy Baioni, Highlands Head Coach. "We came in a little up in the zone and that's all it took for hard-hit balls all game. We couldn't get breaking balls over early. Tip your cap to West Jessamine. They deserved it." Jody Hamilton became the first coach in state tournament history to guide two different teams to the state championship. Hamilton also guided Boyd County to the state championship in 2001. West Jessamine outhit Highlands (35-7), 12-7. The Colts also committed the game's lone error. Ryan Layne led the Colts going 3-for-3 with a run batted in and run scored. Tucker Greer and Kendall Peters had two hits each. Greer scored twice and Peters had three RBI and a run scored. Trey Merida tripled for the Colts and Emerson James doubled. 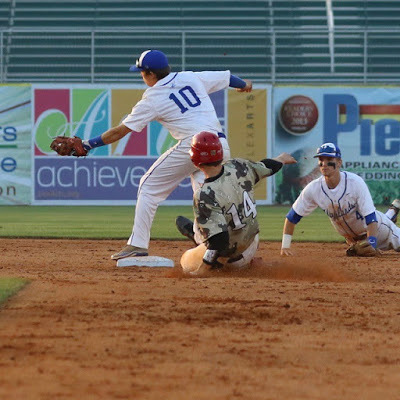 The Bluebirds saw Grayson Heck and Jake Whitford record two hits each. Whitford tripled and scored two runs. West Jessamine pitcher Joseph Ivey (8-1) threw a complete game. He struck out seven and walked none. The first four batters reached against Highlands starter Mitch Jones (7-3). Josh Blancett was hit by a pitch and took second when Greer singled. Trey Merida then threw a walk to load the bases before Peters singled in Blancett and Greer to make it 2-0 Colts. Following a strikeout, Troy Merida singled to score Trey Merida and Peters to make it 4-0 Colts. James Emerson delivered another blow with a two-run double before Ethan Doty took over and stopped the damage. "We just had to do what we had to do," Doty said. "The whole team wouldn't stop fighting. It's a game about will. If you give it your all, you make it here. It's just a shame we couldn't do more." Doty kept the Colts off the scoreboard the next four inning while Highlands chipped away at the lead. The Bluebirds scored twice in the second. Joseph Martin singled home Whitford and took second on the lone Colt error and Conner Kreeger singled him in. The Bluebirds scored their final run in the fourth inning. Whitford tripled to right and D.J. Mills singled him home to cut the Colt lead in half at 6-3. "We've preached seven innings and 21 outs all year," Baioni said. "We told them it was early enough we could keep chipping away. Offensively, I felt like we could come back. Unfortunately, we weren't able to." The Colts made it 7-3 in the sixth inning. Trey Merida scored when Peters grounded out. West Jessamine delivered the final blow in the seventh inning. Trey Merida tripled home three to make the final score of 10-3. Highlands graduates 12 seniors from this historic run. They are Brady Murray, Alex Veneman, Todd Ramey. Whitord, Mills, Martin, Luke Hennigan, Jones, Heck, Lou Bunning, Kenny Ball and Jacob Noe. Murray, Veneman, Mills, Heck, Bunning and Noe helped the Bluebirds football team to its 23rd state championship in school history in December. "It hurts right now, but we'll be able to reflect on it," Ramey said. "The seniors who came through really changed Highlands baseball with the work ethic and the time they put in. We hope to pass it down not just the next few years, but for generations." But one game does not overshadow the whole season. The Bluebirds still have 9th Region and 36th District championships. They are the first 9th Region squad to play for a crown since Beechwood lost to Lexington Catholic in the 2006 state championship game. The Bluebirds are 4-4 all-time in the state tournament. Their only other win in the tournament came in 1965. Ryan Layne, 3-for-3, one run, one RBI. Tucker Greer, 2-for-3, two runs. Jake Whitford, 2-for-3, double, two runs scored.